It is with great sadness that I write this update to all of you. 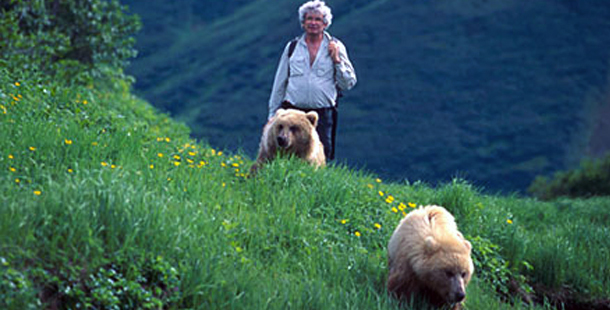 In May of 2003, Maureen and I arrived at our cabin in Kamchatka for our eighth year in the field, studying the bears chronicled in Walking with Giants. Rosie, Chico, and Biscuit had become part of our family, and we were excited and anxious to see how they were doing. What we found on our arrival was unimaginable: a bear gall bladder hanging on the wall. At first we refused to accept this proclamation as the barbarous message it was meant to be. But as time passed and we could find no trace of any of the bears we had come to know so well, we were forced to accept the meaning of the message: While we had been away for the winter, all our wonderful bears had been killed. Maureen and I could hardly function we were so devastated. The loss of these bears plunged us deep into grief and anger, and we have struggled to understand the nature of the slaughter. Was this horrible and incontrovertible proof that bears are more adaptable and forgiving than people are? Had these bears been killed precisely because of our success with them? In time, we would come to understand that it was the success of the ranger program we had funded to protect our bears that ended up being their undoing. People in Kamchatka had finally been coming around to the notion that a live bear was worth more to them than a poached bear. The World Heritage Site in which our cabin sits had long been a sanctuary for poachers, not wildlife, and someone clearly wanted a return to the old status quo. 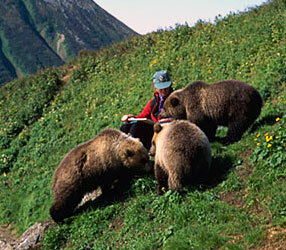 I have not given up on the work in Kamchatka. From the time I learned that the efficiency of our ranger program was threatening enough to bring about the death of our bears, I have been looking into how I can possibly keep it functioning. I will find a way to continue on my own until some organization, agency or perhaps the Russian government itself, can relieve me. Although the South Kamchatka Sanctuary, where we have lived with our bears for eight years, has been proclaimed a World Heritage Site, without some form of substantial protection the designation is meaningless. I am determined to find a way to give this wonderful area the care it deserves. As for our ranger program, some crucial aspects of the program have to be adjusted. In the spring of 2004 I will go to Moscow, then on to the Far East to attend meetings in Petropavlovsk. I have also long seen a need in North America to help communities coexist with bears and other wildlife. I am working on an opportunity to apply much of what our bears taught us in Russia, to our everyday living with them here. I anticipate this will keep me busy for years. I would like to thank all of you for your letters of concern and your calls for justice. They have helped Maureen and I make it through one of the most difficult times in our lives. It’s people like you who continue to spread the word, help make this world a friendlier place and give us conviction and perseverance to stay on course. Thank you from the bottom of our hearts. If you’re interested in learning more about Charlie and Maureen’s bear research in Kamchatka, they’ve written two books on the subject: Grizzly Heart: Living Without Fear Among the Brown Bears of Kamchatka and Grizzly Seasons, the companion album of photos.